You are at:Home»Life in Slavery»Where is Crispus Attucks buried? Headstone of the victims of the Boston Massacre at the Granary Burial Ground. Click image to enlarge. Crispus Attucks is buried in the Granary Burial Ground in Boston, Massachusetts. 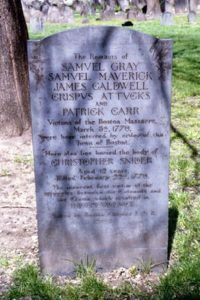 All five victims of the Boston Massacre, Crispus Attucks, Samuel Gray, Samuel Maverick, James Caldwell and Patrick Carr are buried together. The body of Christopher Snider, a 12 year old, who was murdered two weeks earlier, is also buried in the same grave. They share one headstone. The Granary Burial Ground is Boston’s third oldest cemetery and was founded in 1660 when space at the King’s Chapel Burial Ground was insufficient to meet the needs of a growing Boston population. 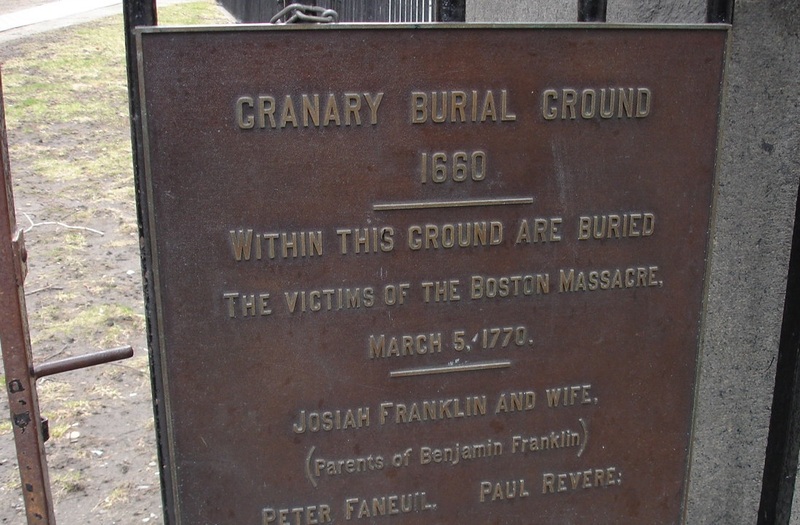 The Granary Burial Ground is located on Tremont and Park Streets near Park Street Church. It was originally part of the Boston Common and was known as the South Burial Ground. In 1737 adjacent lots which included the granary building and a house of corrections were redeveloped into public buildings and private housing. The South Burial Ground took the name of Granary Burial Ground. Many notable citizens are buried in the Granary. Declaration of Independence signers John Hancock, Robert Treat Paine and Samuel Adams and patriots Paul Revere and James Otis. The parents of Benjamin Franklin and important politicians, literary authors and artists rest in this cemetery. It is believed that more than 5,000 bodies are buried at the Granary. There are 2,300 headstones, most families have one headstone.